Last year I posted a resource for analysing AS and A2 Spanish results which a number of people found quite useful. 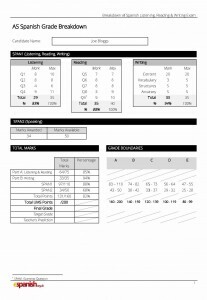 The result is a document like the one below which you can give to students to help them see at a glance how they performed in each part of the paper. Last year my students found it really useful to help them identify where they needed to focus their efforts in their second year. To use it you need to have access to eAQA and you have to be prepared to do a bit of copy and pasting. 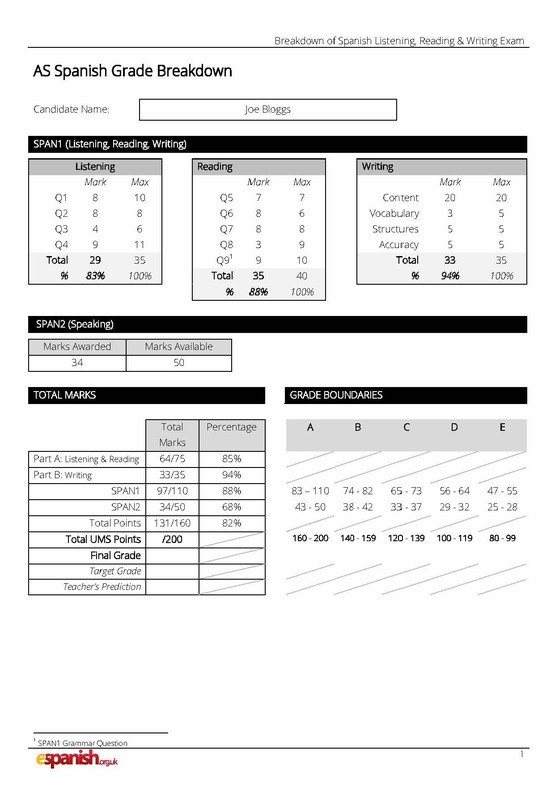 The eAQA site shows you how students have performed for each individual question and what you will need to do is copy this information into the pink columns of the spreadsheet (note there are two workbooks – one for SPAN1 and another for SPAN3). The columns with orange headings calculate automatically so don’t touch them! Once you have completed the spreadsheet, save it somewhere and then when you open the appropriate word document (either the AS or A2 Grade Report) you will be prompted to locate the source document (which is the Excel document you just completed) to complete the MailMerge. These are brilliant, Glen, for giving useful feedback to students – and they cut down on workload for us. Thanks very much!